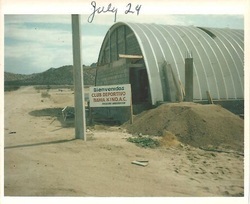 In early October of 1977, 23 people met to discuss the growing needs of Kino Bay. They organized a club dedicated to helping sportsmen and fostering boating safety and elected the first officers. On October 26, they met again to discuss chartering the new Club under Mexican laws. Each contributed 500 pesos (US$22.50) to establish a working fund. They drew up by-laws, named a chairman of the rescue program (soon to become "Rescue One"), and met with lawyers in Hermosillo to get the Club chartered.